Multi-store memory model: sensory register, short-term memory and long-term memory. Features of the multi-store memory model including: coding, capacity and duration. 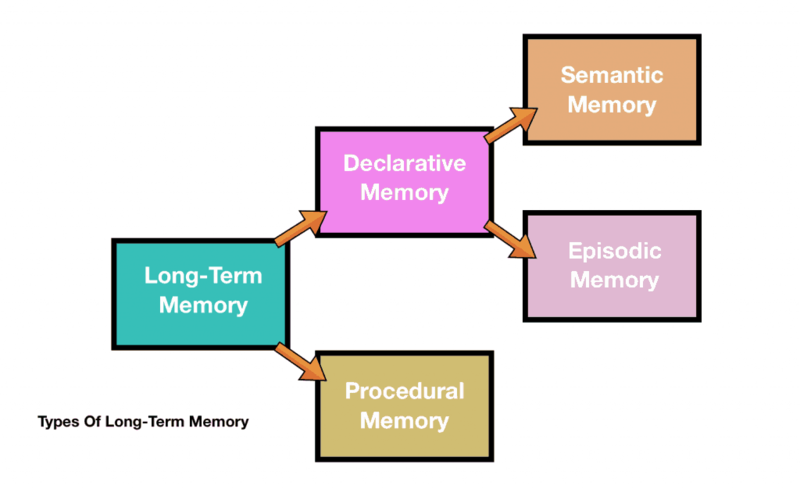 Types of long-term memory: episodic memory, semantic memory and procedural memory. 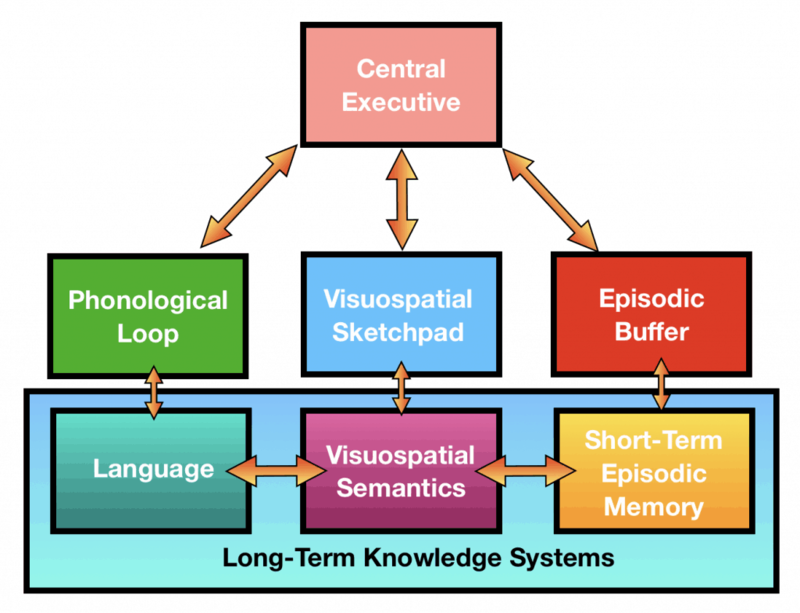 Working memory model: central executive, phonological loop, visuo-spatial sketchpad and episodic buffer. Features of the working memory model including coding and capacity. Explanations for forgetting: proactive interference, retroactive interference and retreival failure due to absence of cues. Factors affecting the accuracy of eyewitness testimony: misleading information, leading questions, post-event discussions and anxiety. Improving the accuracy of eyewitness testimony using the cognitive interview. Animal studies of attachment: Lorenz and Harlow. Explanations of attachment: learning theory and Bowlby’s monotropic theory. The concepts of a critical period and an internal working model. Ainsworth’s ‘Strange Situation’. Types of attachment: secure, insecure-avoidant and insecureresistant. Cultural variations in attachment, including van Ijzendoorn. Atkinson & Shiffrin proposed the multi-store memory model which is a structural model composing of 3 separate stores with information passing between stores in a linear way. The 3 stores are the Sensory memory (SM), the Short-term memory (STM) and the Long-term memory (LTM). The sensory memory has several stores called sensory registers (SR) with each processing information from a particular sense. The iconic register processes vision, the echoic register process sound and the haptic register process touch. The sensory register is not under cognitive control and is the first storage system for incoming information. Information received is raw and unprocessed and the sensory register has a large capacity however the duration of storage is milliseconds unless given focused attention in which case it will move to the short-term memory store. Rehearsal maintains information in the short-term memory store however it is still vulnerable to being forgotten due to limited duration (decay) or being displaced by new incoming information due to limited capacity (displacement). If rehearsed and processed deep enough (e.g. through elaborative or maintenance rehearsal) the information then passes to the long-term memory store (LTM) which has unlimited capacity and unlimited duration dependent on the level of processing of the information received. While long-term memory encoding is mainly semantic and based on meaning, the short-term memories encoding is acoustic with a capacity of 7 +/- 2 items and a duration of up to 18 seconds. Retrieval of information from the long-term store occurs through information passing back through the short-term memory store. Research evidence by Glanzer et al demonstrated support for the STM and LTM being different stores. Participants were tasked with recalling word lists with earlier and later words more likely to be recalled and this was known as the primacy and recency effect. This Primacy effect occurs as the first words are transferred to LTM while the Recency effect occurs as the last words are still within the STM. Delays of 10 seconds or more before recall resulted in only a primacy effect with only LTM affected. This highlighted the difference in STM and LTM supporting the multi-store memory model theory. A major strength of this model is that the models predictions around memory can be easily tested to verify whether it applies to human behaviour. The evidence supports the idea of STM and LTM being separate types of memory and it has been verified through the use of PET scans and FMRI scans when participants have been doing separate tasks related to short-term memory and long-term. The prefrontal cortex is seen to relate to STM while the hippocampus associated with longterm memory supporting the models idea of different memory stores. The multi-store memory model can be argued to be oversimplifying memory structures and processes. Shallice et al highlighted this with a case study of KF who suffered brain damage resulting in difficulty with verbal information in STM but normal ability with visual information. This highlights how STM is not a single store as the MSM suggests. LTM may not be a single store either as Schachter et al proposed 4 different types of LTM stores; semantic memory which was memory for knowledge, episodic memory which ranged from your own actions or what you did, procedural memory such as riding a bike or learning to read and perceptual-representation systems (PRS) which was memory related to recognition of specific stimuli. Spiers et al studied 147 patients with amnesia finding evidence to support Schachters theory finding problems with semantic and episodic memory but not procedural or PRS highlighting even LTM is not a single store as the theory for multi-store memory proposes. The case study of Clive Wearing highlights this further where he was found to have lost his episodic memory but not procedural again suggesting more than one type of LTM store. However this was a single case study of one individual and may lack external validity to wider generalisation due to possible individual differences. The model is supported by amnesia cases as patients have been found to either lose their STM or LTM abilities but not both. This supports the multi-store memory model as it shows both memory stores are separate as the model proposes. One major weakness is that in real life memories are created in contexts rather than within laboratory-based “free-recall” experiments which the MSMM is heavily based on. This lacks ecological validity due to the artificial settings and therefore external reliability to real world situations as results may differ. Lockhart et al also proposed that rehearsal was not the only means by which memories may be transferred to LTM and the level of processing was another method hence the inclusion of elaborative rehearsal in the revised MSM again highlighting the overly simplified nature of the model. Long-term memory (LTM) is believed to be divided into two main types of memory. The first is Declarative memory which is a type of conscious memory also known as “knowing that” memory which helps us recall facts. This is also subdivided into episodic memory and semantic memory. The other is not consciously recalled and is known as “knowing how” memory, or procedural memory. This helps us recall procedures such as how to tie our shoelaces, cycle or swim. Episodic memory consists of memories such as our thoughts or experiences we have had and our personal recollection of them. Memories that are episodic are usually based on events that occur in peoples lives however over time they move over to semantic memory as the events association diminishes and the memory becomes “knowledge” based. The strength of episodic memories is determined by the emotions present at the time the memory is being coded. Traumatic life events may be recalled better due to the strong emotional attachment they have and it is believed that episodic memory is what helps us distinguish between our imagination and real events. The pre-frontal cortex of the brain is linked to the initial coding of episodic memories and consolidation and storage associated with the neocortex. Semantic memory contains the knowledge, facts, concepts and meanings the individual has learnt e.g. the capital of France is Paris. Semantic memory may also relate to how certain objects work, their functions, appropriate behaviour in situations or abstract concepts such as language or mathematics. The strength of semantic memory is positively correlated with the strength of processing that occurs with semantic memories lasting longer than episodic memories. Semantic long-term memory is linked to episodic long-term memory with semantic memories formed based on experiences that occur. Therefore episodic memory underpins semantic memory with episodic based experiences moving over to semantic memory over time. Semantic coding is mainly associated with the frontal and temporal lobes with opinion on semantic LTM being mixed; some argue the hippocampus is involved while others believe several parts of the brain play a role. Procedural memory is skill based memory and focused on recalling how to do something i.e. swimming, reading or cycling and does not require conscious thought. Procedural memories are usually learn’t through repetition and practice. Language is believed to be a procedural memory as it helps individuals speak using the correct grammar and syntax without having to consciously give this thought. Procedural LTM is linked to the neocortex brain areas within the primary motor cortex, cerebellum and prefrontal cortex. This is different to declarative memory stores as it does not rely on the hippocampus to function. Research evidence supports the case for their being 3 different memory stores associated with the LTM. Brain scans have shown 3 distinct areas being active with the hippocampus and other parts of the temporal lobe such as the frontal lobe associated with episodic memory. Semantic memory has been associated with activity in the temporal lobe while procedural memory associated with the cerebellum and motor cortex. This supports theories for 3 distinct stores of long-term memory. Case studies such as HM (Milner 1962) support the case for procedural and declarative memory stores being distinctively different. HM could not form episodic or semantic memories due to the destruction of his hippocampus and temporal lobes however he was able to form procedural memory through learning how to draw figures by looking at their reflection (mirror drawing). However he could not recollect how he had learnt this skill supporting the case for different stores between “knowing how” to do something and semantic knowledge based memories or experience based (episodic). A weakness with this study is it is based on a single individual therefore making it difficult to generalise the findings to the wider population as deficits in memory may be unique to this one person. Another major weakness into theories for long-term memory is the lack of research into brain areas that are involved in procedural memory. Case studies of individuals with brain damage that affects procedural memory but not declarative memory is needed to understand this better however such cases are extremely rare. Therefore we cannot conclusively say the procedural memory store is fully understood with any detail to generalise such a theory. Support for semantic and episodic memory being separate comes from Vicari et al (2007). A case study of a young girl (CL) who suffered brain damage after the removal of a tumour found deficiencies in ability to create new episodic memories. However she was still able to create semantic memories supporting the theory that they are separate. The working memory model replaced the idea of a unitary Short-term memory store (STM) and suggested a system involving multiple stores consisting of active processing and short-term storage of information. In this model STM is an active processor (working memory) which the “Central executive” (CE) “attends to and works on” either speech based information received from the articulatory-phonological loop or visually coded information received from the Visuospatial sketchpad. The Central Executive is the main component and coordinates the other “slave systems” and ensures they don’t go astray. The slave systems (phonological loop, visuospatial sketchpad and episodic buffer) can also be used as temporary storage systems to free up capacity within the CE to deal with other demanding tasks. Capacity for the CE is very limited and it receives information from the senses or from long-term memory. It is also involved in directing “attention” and resources towards particular tasks. The Articulatory-Phonological loop processes speech based information preserving its order within the phonological store which acts like an “inner ear”. The articulatory control process (inner voice) is linked to speech production and is used to rehearse and store verbal information from the phonological store through a form of maintenance rehearsal. Again this has limited capacity determined by the amount of information which can be spoken out loud in 2 seconds. Confusions often occur with similar sounding words as it is an acoustic store. The Visuospacial sketchpad (VSS) processes visual information through the senses (eyes) or longterm memory on what things look like, patterns of recognition and spacial information consisting of the relationship between things and perception of movement. Logie (1995) suggested the VSS could be further sub-divided into a visual cache (CV) which stores visual material on color and form and an inner-scribe (IS) which deals with spatial relationships, rehearsal and the transfer of information from the visual cache to the central executive. While the Phonological loop and Visuospatial sketchpad deal with the processing and temporary storage of specific types of information, the episodic buffer works as an extra buffer that integrates information from all 3 main systems as well as longterm memory. The central executive has no storage capacity of its own and Baddeley realised the model required a general store to explain why some amnesia patients with no longterm recall could recall information immediately. This suggested a temporary buffer existed. The episodic buffer has limited capacity and also maintains time-sequencing recording events as they happen and transferring this information into the long-term memory. A major weakness to the working memory model is little is known about the main component, the central executive or how it works and there is evidence suggesting this is not unitary. Critics argue the Central executive may not be a single element and Eslinger et al highlighted this with one patient EVR who had a cerebral tumor removed. While he performed well on reasoning tasks suggesting his CE was functional, he struggled with poor decision making skills suggesting some elements of his CE was partly damaged. This suggests there may be other components to the CE which the WMM is unable to explain due to it being over-simplified in its theory. The model is also unable to explain how musical memory works as participants may be able to listen to instrumental music without impeding their performances in other acoustic tasks. Also it is not fully understood how the link between working memory and longterm memory works and this is not fully explained either. Baddeley demonstrated the existence of the visuo-spatial sketchpad when participants were given the task of tracking a moving light with a pointer. While doing this they were tasked with one of two other tasks: One to describe all the angles on the letter F and another to perform a verbal task. Describing the angles was difficult as both tasks competed for the limited resources of the Visuo-Spatial sketchpad but not the verbal task as that involved two different slave systems. This demonstrated the limited capacity of the Visua-spatial sketchpad but also how it differs from the Phonological loop which is responsible for auditory tasks. 45 Objective evidence in support of the WMM comes from PET scans which show different parts of the brain become activated when doing visual and verbal tasks. This suggests the Phonological loop and visuo-spatial sketchpad are separate systems supported by biological evidence. The WMM model is only a model for temporary short-term memory and does not attempt to explain how memory works as a whole including long-term memory. Therefore the model is incomplete as an explanation which is a major weakness. Klauer & Zhao provided support for the visual cache and inner scribe. They found more interference occurred between two visual tasks compared to a visual and spatial task suggesting both were separate components with the visual cache dealing with color and form and the inner scribe dealing with spatial relationships. Pet scans also support these findings with brain activation apparent in the left hemisphere when doing visual tasks and right hemisphere activity when doing spatial tasks which supports the idea that the VSS is further subdivided into a separate visual cache and inner-scribe. Much of the evidence for testing the different components such as the VSS and the PL have often relied on dual task techniques where participants are required to carry out two simultaneous activities. The problem is they lack external validity and realism due to the artificial setup and they are not tasks people would usually do in everyday life. Therefore studies that have tested for the WMM lack mundane realism. Interference theory argues forgetting occurs due to two memories competing and being affected by past memories or possible future learning. The more similar the two memories are the more interference it causes as the two memories become confused with one another. Two types of interference are proposed to occur: proactive interference and retroactive interference. Proactive interference occurs (PI) forward in time and with the coding of new memories being interfered with due to past similar memories. For example an old mobile number is recalled when trying to recall the new mobile phone number. Keppel and underwood (1962) demonstrated proactive interference. Participants were tasked with recalling consonant trigrams after varying intervals where they were tasked with counting backwards in threes. Forgetting increased after each interval however little forgetting occurred at the start. Proactive interference can explain this as earlier consonants entered the long-term memory and thus interfered with the formation of new memories. Retroactive interference (RI) occurs backwards in time when the coding of new information disrupts previously stored information. For example you learn your new mobile number but are unable to remember your old one. The new memory therefore affects recall of the old memory. Ceraso (1967) suggested one possible explanation for RI was there was no actual loss of information but merely the wrong information was accessed as it had been moved. Unlearning theory however suggests the new learning replaces the old learning. Muller (1900) identified retroactive interference through a study where participants tasked with learning a list of syllables are given an intervening task between exposure to the syllables and recall. The intervening task (describing paintings) produced retroactive interference with participants struggling to recall their lists. McDonald et al (1931) experimented with participants giving them lists of adjectives to remember (List A). After learning List A they were given List B and tasked with learning this. Recall was found to be poorest when List B was a list of synonyms of List A (12% recall) supporting the case for confusion to occur between the two memories as interference theory states. There is a huge body of work and research which supports retroactive and proactive interference occurring. One major weakness with interference theory is the interference effects are more evident in laboratory based settings using various memory based tasks. These setups lack ecological validity and also mundane realism as the tasks are rarely indicative of what people would experience in real life situations. Therefore it makes it difficult to generalise the findings externally beyond the laboratory settings or understand exactly how much day-to-day forgetting can be credited to interference or even forgetting in general. Anderson (2000) believed interference did play a role in forgetting but it was difficult to understand exactly how much. Individual differences can also explain why some people are less affected by proactive interference when compared to others. Kane et al (2000) found individuals with bigger working memory spans were less susceptible to proactive interference when testing recall using three word lists compared to individuals deemed to have less working memory spans. It is unclear whether those with greater working memory spans have achieved this either through more practice in some form but it highlights how interference theories cannot be fully generalised to everyone. Understanding how interference works offers advertisers real world applications for marketing campaigns as they attempt to build brands. Danaher (2008) found when people were exposed to adverts from competing brands within a short time frame, participants struggled to recognise the brands or their message. Considering the millions spent on advertising this presents a big problem but also provides marketers practical ways to overcome this. By ensuring adverts are spaced significantly far apart from the airing of rival brands or by repeating more on one day rather than over the weak with rival brands, this can help avoid dilution of adverts. Another major weakness for interference theory is it only explains forgetting when information is similar and can not explain why forgetting occurs in the majority of real life situations. Also forgetting due to similarities doesn’t happen that often either suggesting it is only one part of a bigger explanation and over-simplified. The fact that there is significant research support for cue-dependent forgetting suggests other explanations or processes must be at which and interference theory cannot not explain everything. Although interference has been proven to occur when trying to remember information, the theory does not offer any explanation as to what the cognitive processes are at work to cause this. Retrieval failure theories argue forgetting from the long-term memory is caused by failing to access the memory due to insufficient clues or cues to aid recall rather than it being unavailable. Similar to a labelling system on a filing system, the cues act as markers to aid recall and without these, the mind is unable to locate the correct memory. A cues effectiveness depends on the number of items associated with it with fewer items leading to a more effective cue. Tulving (1973) called this the encoding-specificity principle; where recollection is affected if the context of recall is different to what it was when the memory was coded. Tulving suggested that memory recall is most effective when information which was present at the time of encoding is available during retrieval. There are two main types of cue-dependent forgetting; context dependent failure and state dependent failure. Context dependent failure may rely on external environmental retrieval cues being similar to when the information was encoded to aid recall, e.g. being in the same room where you learnt the answers to a test and then taking the test in this room. This would result in greater recall than being in a different room. Environmental context such as being at a particular place can trigger retrieval as can particular sights or sounds if they are experienced strongly enough during encoding. Abernethy (1940) found that after participants had learnt various material, they showed greater difficulty with recall when they were tested by an unfamiliar teacher in an unfamiliar room compared to a familiar teacher and familiar room. This shows support for the importance of context aiding the memory retrieval process. State dependent failure would occur when the internal state of the person is different to when the information was encoded. This may be down to feeling a different emotion for example and trying to remember something when you were happy while you are feeling sad. Therefore internal states can also act as retrieval cues. Support for state-dependent failure comes from a study by Overton (1972). Participants learnt material either drunk or sober and found participants struggled with recall more when trying to retrieve the information in a state that is different to the time of encoding. For example trying to recall information sober when it was learnt drunk (and vice versa). This provides support for state dependent failure as an explanation for forgetting. Many studies into retrieval failure due to cue dependent forgetting are based in the laboratory and lack ecological validity and mundane realism as they are not indicative of real world environments or situations of forgetting. Also such explanations are not able to explain why retrieval failure cannot be explained with cue dependent forgetting for activities such as riding a bike suggesting retrieval failure as a theory for forgetting is oversimplified and incomplete. Research into retrieval failure and cue dependent forgetting has real world applications particularly in the search for missing people and reconstructing the last known whereabouts. This was used to aid in the conviction of Danielle Jones killer as a reconstruction in 2001 prompted witnesses to recall her arguing with a man which later led to the conviction of her uncle through witness testimony. This has also helped in cognitive interviews to help people recall information for witness testimonies. Therefore understanding how cues affect recall can help us develop ways to improve memory for the benefit of society. Support for retrieval failure having more validity than Interference theory comes from Tulving and Psotka (1971). They showed how interference effects occurred due to the absence of any cues to aid retrieval. Participants were given word lists to remember with one condition having category headings and another without. In conditions without category headings, fewer words were recalled than when headings were present showing the information was available but simply unable to be accessed due to the absence of cues. Research into state dependent failure such as Overtons (1972) study raise ethical concerns as they encouraging people to become drunk and under the influence of substances which can lead to injury or even death even by accident. Also the level of engagement from participants when under the influence of alcohol may not necessarily be genuine due to the way it affects peoples willingness to give honest responses. Some participants may have deliberately done poorly in some situations or try harder in others due to how alcohol affects people in unpredictable ways. Baddeley (1997) criticised the encoding specificity principle as impossible to test and verify for certain making it unscientific. If a cue aids retrieval then it could be argued to have been encoded in the memory however if it does not then it could be argued that it wasn’t encoded in memory as a cue. The fact that it is impossible to test for an item as having been encoded or not means we cannot fully test the encoding specificity principle. Baddeley’s (1975) study did find supporting evidence for cue dependent learning and how context cues aided retrieval. Divers tasked with learning material either on dry land or while underwater were found to have poorer recall when they were tested on retrieval in a context that differed from where encoding and learning happened. For example testing them for material they learnt underwater while on land resulted in poorer retrieval than if they were tested while still underwater. The same was true vice versa too with better recall shown when the learning context remained the same as encoding. This supported cue- dependent failure however this was during free recall only. When given a recognition test and asked to say whether the item on the list was in the learning list or not, context based failure effects were not observed showing how cue dependency can not explain all forms of forgetting. The new AS and A-level psychology content you’re required to know for factors affecting eyewitness testimony has reduced compared to the old specification. You now only need to know about how factors such as misleading information and anxiety affect eyewitness testimony. For questions on misleading information; the specification outlines how leading questions can affect eyewitness testimony. Loftus and Palmer (1974) conducted various experiments measuring how leading information affected recall and is the primary research study you need to know as part of your revision. 45 students were shown several films of road traffic incidents and then given a questionnaire to describe the accident and answer a series of questions about their observation. One critical question varied between conditions with one group asked asked how fast the vehicles were going when they “hit” each other while other groups had verbs implying different degree’s of collision such as “bumped, smashed, contacted, collided”. Results found the words that implied a stronger collision resulted in greater average estimates of speeds from participants. Those exposed to “smashed” gave the highest estimates (41mph) while “contacted” resulted in the lowest speed estimate (30mph), demonstrating how leading questions could influence memory recall. The experiment was recreated with another group with the verbs “smashed” and “hit” while a control group was not exposed to such leading questions. They were questioned 1 week later and asked a series of questions with one critical question being whether they witnessed any broken glass. There was no broken glass in the film however results found that those who were exposed to the “smashed” condition and thus led to believe the car was traveling faster were more likely to report seeing broken glass with the control group being least likely. This highlighted how misleading information post-event can change the way information is stored or recalled. Loftus & Pickrell (1995) conducted a study into how misleading information could create false memories in individuals. 24 participants ranging in age from 18-53 were given four stories about their childhood gathered from relatives. Three of the stories were true while one was false and it included being lost in a department store when aged 5 and an elderly lady rescuing them. Participants were then asked questions on whether they recalled these stories and results found 29% of the fake stories were recalled by participants believing them to be true. 68% of the true stories were recalled correctly also. This highlighted how false memories could be created from suggestion and misleading information. The weakness with research into misleading information and post-even discussion is that such studies are laboratory studies and therefore lack ecological validity and realism. Due to this results gained in such settings may lack external validity and wider generalisation. The strength of the study however is the laboratory condition allowed researchers to control for extraneous confounding variables and clearly see the link between leading questions and recall. The laboratory setting has also made it easier to verify results for reliability through replication and establish cause and effect relationships between leading questions and memory recall which would be difficult to do in real world settings. Repeat studies have concluded similar findings leading researchers to conclude leading questions and misinformation can affect recall. However the use of students may have been a confounding variable in itself rather than leading questions as they are not representative of the range of ages in the normal population and therefore the sample lacks population validity also. Also research suggests age may be a confounding variable in itself when it comes to leading questions with Warren et al finding younger children were more susceptible to influence to misleading information than older . Therefore this study may lack internal validity as it may be more of a measure on how leading questions affects one particular age group (students) rather than the wider population. The use of questionnaires is also another possible weakness as questions can be easily misunderstood by participants or misinterpreted without clarification. Peoples responses may also be misunderstood by researchers. More interestingly real life studies outside the laboratory setting by Yuille and Cutshall have found that witnesses to real events tended to have accurate recall even many months after witnessing events with misleading questions having little affect suggesting previous findings by Loftus into leading questions may possibly be limited to laboratory settings. This may be explained due to highly motivated participants displaying demand characteristics that may not be indicative of real witnesses. In real situations arousal, stress, anxiety or concentration may be a stronger factor in recall than leading questions. Forster et al found supporting evidence for this in one study where participants who thought they were watching a real life robbery and believed their responses would have an impact on an upcoming trial actually be more accurate in their recall. Although ethical issues are raised due to the participants being deceived into thinking what they were watching was real; the findings suggest leading questions may have some impact in laboratory settings but in real life other factors (such as arousal, stress, concentration or motivation) may mitigate for this and override their affects. Deffenbacher reviewed 21 studies finding the stress-performance relationship followed an inverted U as proposed by the Yerkes-Dodson Curve. This means that the efficiency of eyewitness testimony depended on the level of stress/anxiety with low and high amounts of anxiety resulting in poorer recall while moderate levels of anxiety yielded the best and most optimum level of recall and performance. The practical application here is that establishing eye witnesses level of arousal/anxiety may be key in court evidence to determine the validity of their account. However this in itself is likely to be difficult and purely based on a subjective measure in itself. Loftus et al found similar findings when two groups in different conditions observed a violent and non-violent event. In condition 1 a man exited a discussion holding a pen while condition 2 saw a man exiting holding a paperknife covered in blood after a loud altercation. The group who observed the pen were more accurate (49%) than the group observing the violent situation (33%). A possible explanation is the weapon may have distracted their attention from everything else happening and may explain why some witnesses struggle for other details in violent crimes as their focus switches to the weapon itself. Clifford and Scott found that people who saw a film of a violent attack remembered less than people in a control group who saw a less stressful version. They concluded that witnessing stressful situations in real life will be far more stressful than observing a film and memory accuracy may well be more affected in real life with poorer recall. However Christianson (1993) et al found contradicting evidence. When witnesses to real bank robberies were tested on recall, they found increased anxiety led to improvements in the accuracy of recall. This suggests high levels of anxiety in situations do not always divert attention away from what is happening. Criticisms of research into how anxiety affects eyewitness testimony point to the fact that studies have been conducted in laboratory settings and therefore lack ecological validity due to their controlled nature. Participants are usually motivated and eager to engage in the study which may be unrealistic of real life witnesses and motivation in itself may therefore be a confounding variable. Therefore the possibility of demand characteristics is very possible with such laboratory studies. The benefit of these key studies being conducted in the laboratory however was that such experiments can be easily replicated for validity and reliability checking as well as limiting confounding and extraneous variables to establish cause and effect relationships between anxiety and eyewitness testimony. Due to the ease of replication other studies have found similar findings showing the findings of Deffenbacher and Loftus are reliable. However again the replicated studies tend to be within artificial settings which could be affecting results and lack external validity and wider generalisation to real world situations which is again limited. Yuille & Cutshalls study contradicts laboratory findings highlighting the importance of stress in eyewitness testimony. Witnesses to a real life violent crime such as a gun shooting were found to have remarkable memories of the stressful situation even after observing the gunman be killed. Even those re-interviewed 5 months later were found to have accurate recall with even misleading questions which were inserted into the questioning having no effect. One thing to note however was the witnesses who experienced the most stress were closest to the event and this may have aided their accurate recall. Therefore proximity to events itself may be a confounding variable in such research studies. This study illustrated that in instances of real life stressful situations recall may be accurate even months later. Also misleading questions, as illustrated, tended to have less of an affect in real life situations compared to Loftus & Palmers laboratory study on misleading questions and stress may be a stronger mitigating factor in recall. Studies that have subsequently found stress/anxiety to aid recall were likely to have experienced the first increasing levels of stress in the Yerkes-Dodson curve while those suffering from poor recall may be due to them being within the second part with over- arousal resulting in poor recall performance. Such studies involving violence (Loftus/ Clifford) to heighten anxiety levels also raise ethical concerns due to the possible psychological harm they can cause from observing such events. Other research suggests age is also a mitigating factor which could be a confounding variables beyond simply anxiety and this needs to be considered also. There is also research evidence to suggest the Yerkes-Dodson curve is far too simplified to explain how anxiety affects eyewitness accounts. Fazey & Hardy (1988) proposed Catastrophe theory which may better explain the conflicting findings of how anxiety affects EWT on a 3- dimensional scale. This includes performance, physiological arousal and also cognitive anxiety too. This model proposes that as physiological arousal increases beyond the moderate optimum level, unlike the Yerkes-Dodson curve where there is a steady decline, they observed a drastic drop in performance which they proposed is caused by increased mental anxiety and worry. However trying to distinguish whether a person felt anxiety or stress in itself would be difficult and subjective. The cognitive interview technique is a method used primarily by the police to aid eyewitnesses in recalling information more accurately. It is based on Tulvings beliefs that several retrieval paths exist to memory recall and information not accessible by one path may be available using varying methods of recall. Report every detail regardless of how trivial it may seem. This is because the recollection of one small memory may act as a retrieval cue for other important memories. Recreate the context of the event itself with the witness encouraged to mentally recreate the environment or contacts they may have had as well as their own psychological state. Doing this may help trigger contextual or emotional cues which aid recall. Recall the event in different orders such as in reverse order or at different stages. This reduces the chance of expectations or existing “schemas” of how an event unfolds influencing recall. Recall the event from different points of view or perspectives of what others may have seen again to reduce the influence of an individuals schema on recall. The interviewer may also try to ensure they reduce the anxiety of the witness, minimise distractions, allow them to take their time in their recall and avoid interruptions or leading questions while the interview occurs. Kohnken et als meta analysis of 53 studies found the cognitive interview increased recall on average by 34% when compared to standard interview methods showing it is effective and has validity. This also has real world applications especially in the world of law enforcement where the police can use this to glean more information from witnesses that may prove crucial to solving crimes and reduce miscarriages of justice. An important criticism to note was that most of the studies involved in Kohnkens meta-analysis consisted of college students and within laboratory settings. The group of students are not representative of the wide age ranges in the population and therefore the sample lacks population validity as the results gained may only be representative of that particular age range being affected by the cognitive interview. Also with student participants age could be a confounding variable as research in other studies has found memory recall to be affected by this and therefore the study may lack internal validity and not be accurately measuring the effects of the cognitive interview completely but rather how one interview technique affects a certain age range of people. The students involved may also have been motivated participants which again is not always indicative of real witnesses and this may affect recall and limit the cognitive interviews application. The laboratory settings lack ecological validity too as although they may help in replicating the study to test for reliability and control for extraneous variables to establish cause and effect relationships, the setting itself lacks mundane realism due to its artificial setup. Fisher et al found supporting evidence for the cognitive interview in real world studies when 16 police officers interviewed 47 people twice who were victims of crime themselves or witnesses. 7 officers were trained to use to the cognitive interview while 9 used standard interview methods and formed the control group. Results found the cognitive interview gained 47% more facts overall compared to the standard interview and concluded it was beneficial for improving EWT. This study used real police officers and real witnesses meaning the study had high external validity to real world application. A possible weakness is the control group of officers may have been demotivated due to not receiving training which may have affected their motivation levels and performance in the standard interview negatively. However although the cognitive interview was effective in gaining more information it was also found to increase the amount of incorrect information given from witnesses. This is a major limitation as interviewers may not always know what is factual or not as the cognitive interview does not guarantee the accuracy of information recalled.